Kitchen and Bathroom Designs that Provide detail and ambiance through creativity, inspiration and teamwork. As an Conceptual Design Artist, I evaluate your surroundings, analyze your needs, desires and dreams. I then dive deep into the not so obvious possibilities to create the solutions making your dreams become a reality... Your Home. Then the real work begins; As a full-service remodeling company we are able to go right from the planning to the building phase of your project. It is our goal to bring high quality construction and products to you in budget and on time using a variety of in house talents, methods and techniques. We use very few (if any) subcontractors for your home remodel – we have our own staff that works with you every step of the way – including licensed electricians, licensed plumbers, cabinet & countertop installers, carpenters, drywall installers, painters, tile installers, a shower door installer, and more. Let us bring you “From The Now To WOW!” David Bauer, Additional Building Experience: Extensive entrepreneurial experience in all areas of property management and construction from the early stages of development through project completion. Total accountability for all facets of construction. Outstanding network of liaisons from government agencies to customer relations. 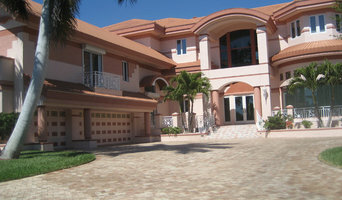 Extensive knowledge of Florida real estate. Marine experience includes dredging, environmental permitting and mitigation. Voted Houzz Best in client satisfaction 2014 and 2016 through 2019. We've been transforming homes, condos and commercial spaces in Naples and throughout southwest Florida, since 2002. Owned by brothers, Brandon and Marcus Palm, Palm Brothers Remodeling works with clients to create show-stopping kitchens, bathrooms, flooring and custom woodworking at competitive prices. Palm Brothers Remodeling also has a luxury Kitchen and Bath showroom, located on the Southwest corner of Pine Ridge Rd. and Goodlette Frank, in the Goodlette Corners plaza. Our showroom is a "one stop shop" and was designed with the remodeler in mind. We feature cabinetry, closet systems, countertops, plumbing, lighting, flooring, moldings and hardware! Come visit our showroom today to discuss your remodeling project! As a family owned and operated business, you can expect to consult with an owner on your job, whether big or small. When a sub-contractor is needed with plumbing, electrical, or a/c work, Palm Brothers Remodeling only hires licensed and insured sub-contractors who uphold the same level of professional integrity and customer satisfaction we're known for. KTS Group was founded and created to help a client work through the design process from concept to final build out. We offer a wide range of services from Architectural design to General Contracting build out, but focus mainly on changing the use of common materials into different design features within our projects. We are proud of the specialized ability to integrate glass features and components into our designs due to our long time experience in the Glass and Glazing industry. We pride ourselves on trying to help clients design and build with respect to their budgets and still maintain a quality of design that sets their project apart from the commonly found design within their surroundings. Small boutique-style Design / Build General Contractors specializing in custom homes, additions, and full scale remodeling. Herscoe Hajjar Architects is a full service architectural firm providing professional design in accordance with the desires, wishes and dreams of our clients. With fine precision and quality craftsmanship, Rob Herscoe and Michael Hajjar are master builders who bring 20+ years of teamwork and partnership to each project they have the honor and privelege of working on.